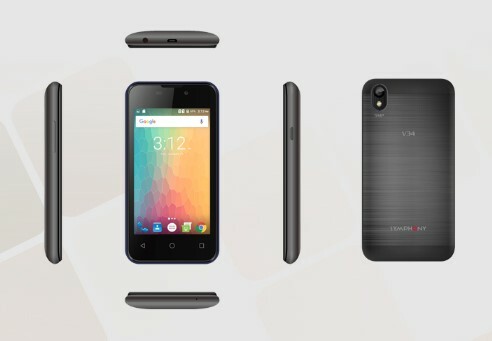 Symphony V34 Price in Bangladesh! The Bangladeshi Number one Mobile Brands “Symphony” brings a new Smartphone price under 4,000 TK with 4 inches WVGA TN Display + 512 MB RAM. If you are searching Symphony Low Price Smartphone, We recommend first Check the Symphony V34 Release Date, Specifications, Feature, RAM, ROM, Camera, Battery and Price. The most important question of all the Symphony Low Price Smartphone Lover, what is the Official Price of Symphony V34? The Symphony V34 Price in Bangladeshi TK 3,850 BDT. Dimensions (mm) 128.2 x 66.2 X 13.24 mm. Weight (g) 145g (with battery). Processor 64bit 1.2 GHz Quad Core Processor. Display Type WVGA TN Capacitive touch screen, 16.5M colors. Resolution 480 pixels x 720 pixels. Front camera 2 MP (Mega Pixel).. Features f/2.2 (Back) & f/2.8 (Front), Face beauty, Panorama. Thanks for staying with us a long time and visiting Symphony V34 Release Date, Specifications, Feature, RAM, ROM, Camera, Battery and Price article. If you have any question or confusion or want to know more about the Symphony Xplorer V34 Smartphone 2017, Just comment here. We reply as soon as possible with a correct answer.